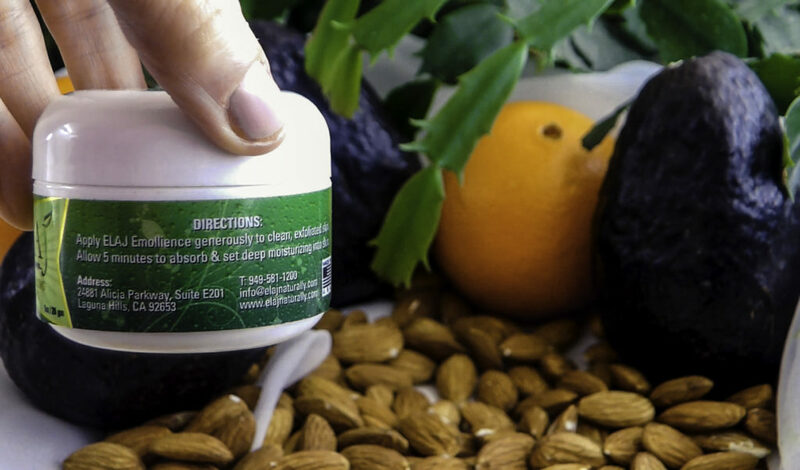 ELAJ Emollient is a healing emollient safe for any skin, even sensitive skin areas. Made of natural ingredients, it will not clog pores, so it is safe to use on the face. It is safe for even children and treats cradle cap and minor rashes. FDA registered, ELAJ is helpful for psoriasis and eczema and other skin conditions that require gentle daily cleansing and care. 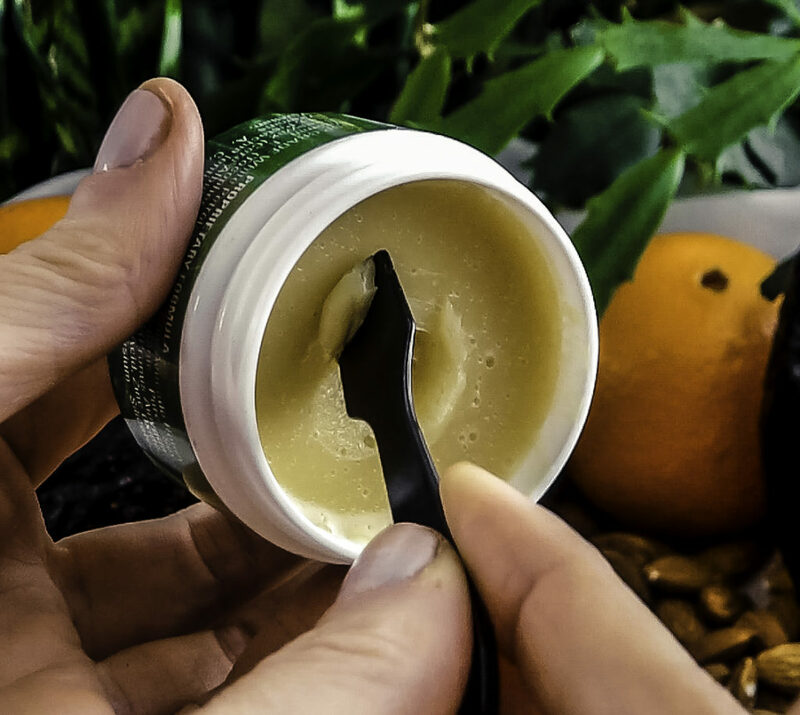 It is healing and protective to severe and painful skin conditions and works wonders as a go-to beauty tool for skin concerns that just won’t respond to commercial treatments. For use as a gentle eye makeup remover that doesn’t sting the eyes! Developed by Dr. M.A. Bchihalouk, the founders’ grandfather, this emollient has been used by Suhein Beck’s family for any skin related problem for years. 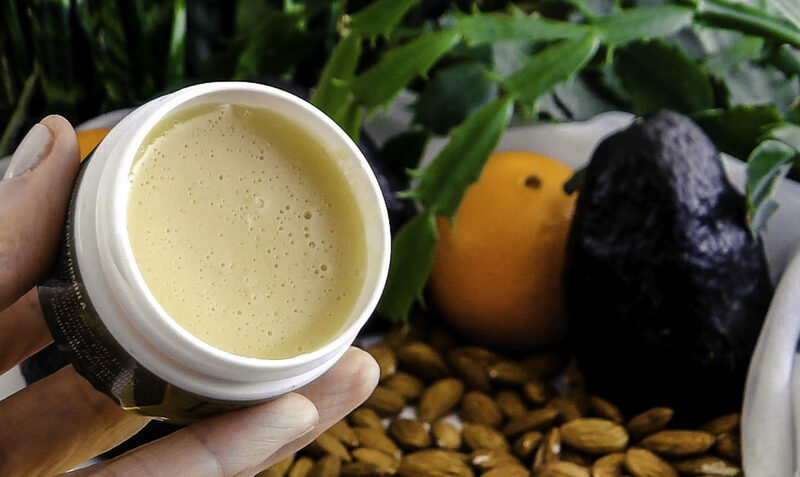 She indicates that everyone who tried it found it wonderfully healing for their eczema, contact dermatitis, cold sores, skin conditions or just rough and dry skin on elbows, feet, hands, and knees. Almond Oil a hypoallergenic oil that is safe even for babies, it is an intensive moisturizer with anti-inflammatory and antioxidative properties, rich in Vitamin E. It also protects skin against UV radiation damage and helps heal existing damage. Avocado is intensely emollient with protective with high oleic acid content. This monounsaturated fatty acid maintains moisture in the epidermal layer of your skin, helping to make it soft and hydrated. Soy Wax relieves psoriasis, eczema, dry skin, cracked skin, cracked heels and rough cuticles. BODY: For use all over including on dry knees, elbows, rough and cracked heels, hands, and cuticles. 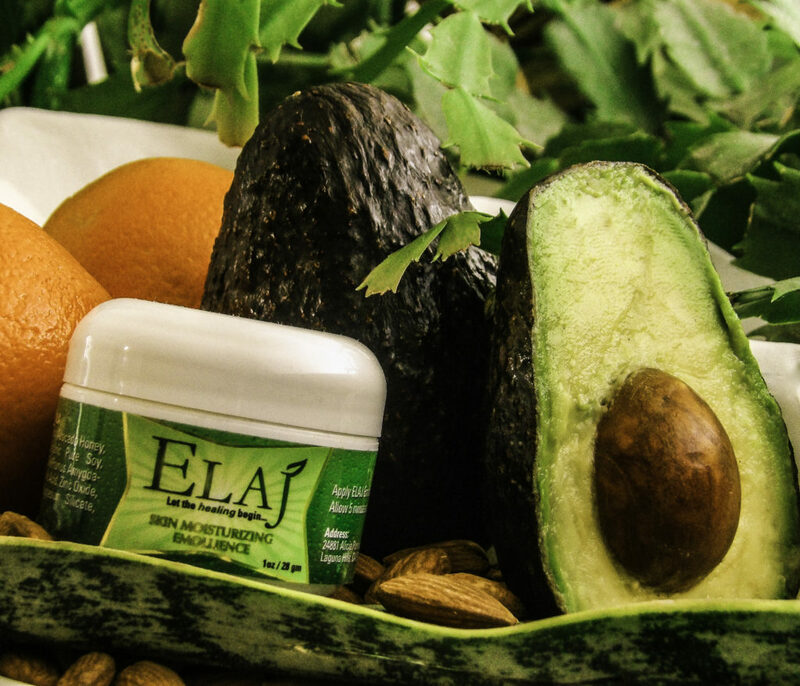 FACE: ELAJ is safe for use on the face as it does not clog pores, making it suitable for treating eczema, psoriasis, acne, razor burn, dry spots, chapped lips, and cold sores. Also delicate skin around the eyes, earlobes, and nose. AN FDA REGISTERERED SAFE ALTERNATIVE TO CORTISONE FOR ECZEMA: MAKEUP & ELAJ FOR ECZEMA ON THE FACE: To cover eczema on your face, blend ELAJ with your foundation and use this mixture to conceal the eczema patch. Finish with a light coating of powder for a matte finish, or leave without powder for a dewy glow. ELAJ FOR A LIPGLOSS WITH NATURAL SUNSCREEN: ELAJ doubles as a lip gloss with a soft sheen and has the natural sunscreen property of Zinc Oxide. ELAJ comes in a small plastic jar; it is semi-transparent with a light golden color, lighter than honey. There is no unpleasant scent. It is a thick consistency which is firmer than Vaseline but not as hard as wax. It melts on contact with the heat of your skin. It is not greasy like Vaseline but does leave a light sheen to the skin. I’ve two near-constant dry skin issues: my almost always chapped lips and my ever-dry cuticles. DRY LIPS: My lips have been dry since I was a kid. I’ve tried everything from drugstore to high-end boutique counter products (READ: slathering CREME DE LA MER concentrate on my lips). I’ve done Pinterest recommended remedies like black tea bags on the lips and Coconut Oils and other treatments. CUTICLES: Even if I use gel lined gloves, my cuticles never look good. I have even consulted my dermatologist over recommended products for my cuticles. If I slather my hands with Coconut Oil at night, by the afternoon staff meeting, my cuticles are red and peeling and dry all over again. While some things work better than others, nothing gives me smooth lips or non-irritated cuticles for a full day, especially when exposed to dry air in my office. 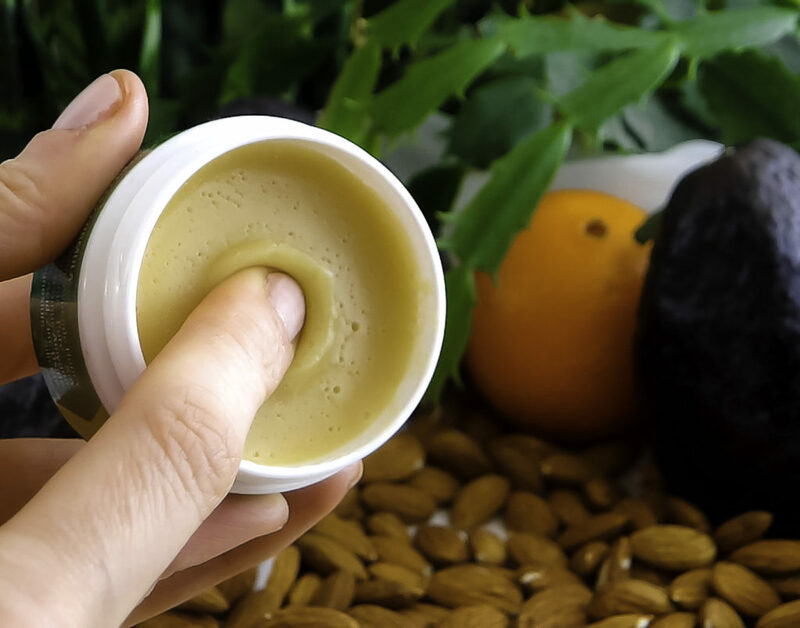 The emollient is thick but softens to smoothly and evenly spread into a thin layer when held between the fingers (similar to the Creme de la Mer creme emulsion process). It looks like a thicker “Bag Balm” or Vaseline consistency, but it is not greasy once worked between the fingers for a minute. CUTICLES: To apply it to my cuticles, I softening it and rubbed into directly into my cuticles and into the nail beds all around the nail and on a few rougher spots on my knuckles. LIPS: For my lips, I applied ELAJ directly onto my lips. I massaged it in, and much of the dead skin sloughed off. I applied a second light coat before going to bed. My lips were smooth in the morning, not chapped. I sometimes get cracks on the side of my lips, these felt a bit different after application, slightly numb, and in the morning the crack was healed without a rough skin patch as normally appears. ELAJ VERSES VASELINE TEST: As a third test, I applied ELAJ to the rough heel on my left foot, and straight vaseline on my right foot overnight. In the morning, the hardened skin on my left foot was soft as if I had exfoliated it off and it stayed that way for several days. My Vaseline covered foot was softer to the touch, but the hard skin remains hardened. 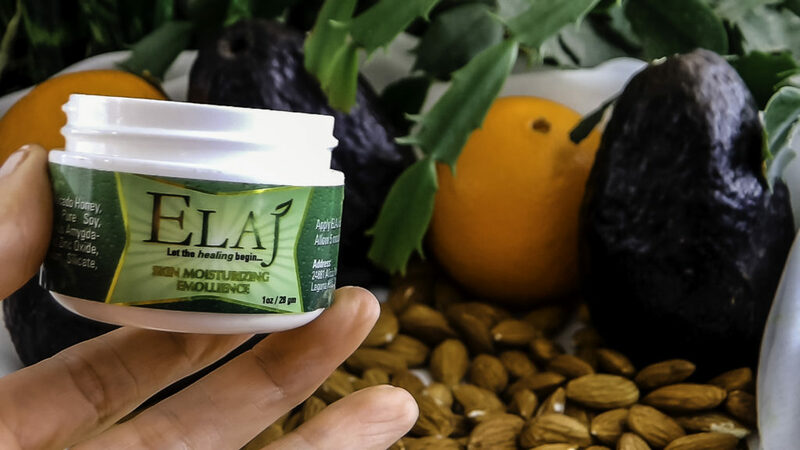 ELAJ is a very useful, all-natural, all-purpose emollient that tackles multiple skin needs, it is safe and effective for eczema treatment and can be worn with makeup on the face. ELAJ stops the itching of psoriasis and eczema, allowing skin to breathe while still providing a protective coating. A natural SPF lip gloss and makeup remover, keeping the two-ounce size ELAJ in your bag is a great multi-tasker when traveling. Style Chicks received this product in exchange for our unbiased review and received compensation for our time and effort. However, our experience with the product and the opinions expressed in this review are 100% ours.